In a saucepan add the 1/4 cup of sugar and the cup of white wine. Stir over medium-low heat until the sugar dissolves into the wine. Remove and let cool. Chill in the fridge until ready to use. Combine desired fruit and sliced mint in a large bowl. Chill until ready to serve. 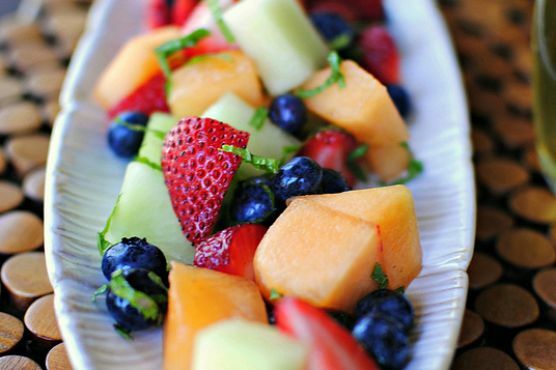 Dish the fruit salad into cute little cups or bowls and drizzle with the wine syrup just before serving.